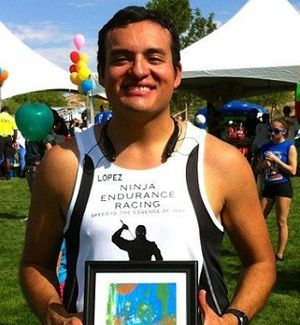 Ninja Endurance Racing's co-founder Alejandro Belmares' running career began right here in Las Vegas at Palo Verde High School. Under the direction of head coach Robert Davis, Alejandro was able to improve his performances culminating with a 10th place finish at the Southern Nevada Northwest League meet in a time of 16:55 in 2003. Alejandro would also compete in track and field for four seasons with his highest achievement being crowned the Northwest League Champion in the 3200m as a senior. Alejandro would be a three year varsity letterman in cross country and track, and also a 2001 state qualifier in cross country. He would continue his running at UNLV as part of the intramural team till 2006. Alejandro would return to the racing circuit after a three year hiatus in 2009 following his participation in soccer. 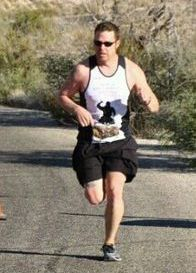 He would run his first half marathon in Mesquite Nevada in 2010 placing 16th respectably. 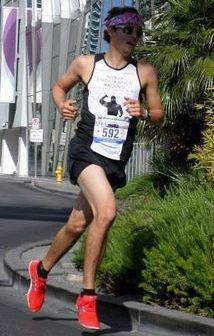 Alejandro would go on to shatter his previous 5K record in October of 2011 posting a 16:15 earning 4th at the 6th Annual Toyota of Orange Chapman University 5K. 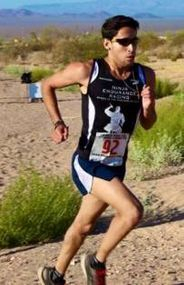 Alejandro would also be the 2011 Las Vegas Track Club Championship Series winner, following his performance in the Rock and Roll Las Vegas Half Marathon. 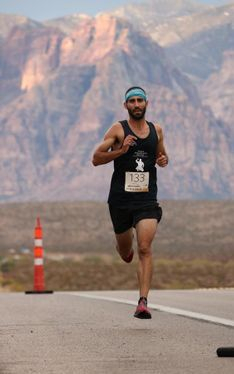 In March of 2012 Alejandro would be the runner up at the Red Rock Canyon Half Marathon finishing in 1:22:37. 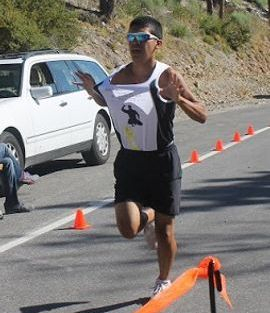 A week later on March 18th at the LA Honda Marathon, Alejandro would debut in the marathon posting 2:53:02, earning a qualifying mark for Boston in 2013. On June 16th at the City Impact Half Marathon in Ventura, Alejandro would once more place second in a half, posting a season best of 1:17:05. 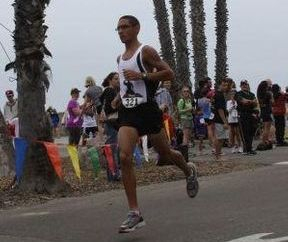 At the OC Half Marathon in May 2013, Alejandro placed 8th overall with a time of 1:15:30. 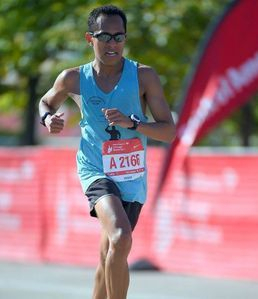 In 2016 at the Chicago Marathon, Alejandro would improve his marathon PR by 7 minutes running 2:47:11. On October 21, 2018 at the Red Rock Canyon 10 Mile Challenge Alejandro would place 5th overall en route to a PR of 58:15. In January of 2019 at the Ontario Mills 10K Alejandro would set the course record as well as earn a PR en route to a finish time of 35:00.4. 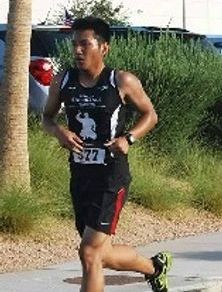 While competing at the Sprouts Mesa-Phoenix Half Marathon in February 2019, Alejandro would PR with a time of 1:15:26. In the future he hopes to one day be able to represent his native country of Mexico at the international level. Born and raised in Sri Lanka Gamini's began running in 2010 with no prior experience. Commencing as a hobby to relieve stress, Gamini's first race would be the Arizona Rock n' Roll Half Marathon posting 1:40:07. A month later he would complete his second half marathon finishing in 1:34:40 at the Rock n' Roll Mardi Gras in New Orleans. He would then transition to the shorter distance races running his first 5K at the 10th Annual 4th of July 5k Blast finishing in 20:11 earning 9th overall. In November he would run his first 10k Max Muscle 10k and complete the race in 43:29 despite battling the flu the day before. To date, Gamini's PRs stand at 17:01 earned at the 2016 B.A.A. 5K, 35:55 for the 10K, 1:18:52 in the half and 2:46:02 for the marathon. Among his favorite charity races Gamini lists the 2011 SEPTEMBER 10th 911 Remembrance 911k Race, Ronald McDonald 5k, Susan G Komen Race for the Cure, Four Seasons Hotel (Season 4 Cure 5k), and the Make a Wish 5k. In 2014, Gamini would become the second member of Ninja Endurance Racing to win the Las Vegas Track Club's Championship Series. He would also win Masters Runner of the Year in 2013, following his performances locally and out of state. 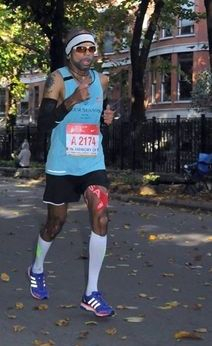 On April 22nd, 2018 Gamini became the FIRST person from Southern Nevada to complete all six Abbot World Marathon Majors by running the London Marathon. He is also the first Sri Lankan to achieve this feat. He is also the farther of a year 10 old daughter (Hannah) and employee of the Four Seasons Hotel and Casino. Brent began running on a dare when he was 25 years old. Without knowing how to train or what he was doing, he struggled to finish his first marathon with a finish time of more than six hours. Even though the race was painful, he was hooked. Since 2011, Brent has run nearly 50 full marathons in 35 different states, including the Boston Marathon in 2017 and 2018. While he has completed countless races at the 5K, 10K, 15K, 10 mile, half marathon and even one 100-miler, the marathon is his favorite distance. In eight years, he has cut his marathon PR more than in half down to 2:42:46 at the 2018 Mesa-PHX Marathon. He also won the 2017 Coeur d’Alene Marathon in a time of 2:54:14 and placed fifth overall in the 2017 Boston to Big Sur Challenge with times of 2:51:03 and 2:51:37 respectively. His current goals are to race a sub-five minute mile and break under the 2:40 mark in the full marathon. Brent worked in run specialty stores for more than five years, and he is also a certified running coach. Jon Russell began his running career in Colorado as a freshman at Cherry Creek High School in 1997. He ran cross country and made the varsity squad by the end of his Freshman season. He would compete at state all four years of high school and would end his high school cross country career with a 5K PR of 16:45. Then, from 2002 to 2016 a bunch of stuff happened not really related to running. Jon was living a productive life but running took a back seat to work and personal life. But in July 2016, Jon decided to begin running again. By February of 2017, he entered his first race in ten years and surprised himself by getting 5th place overall. The rest is history. Since then, Jon has gotten first overall in the 2018 Red Rock Half Marathon (1:21:50), first overall at the 2018 Summerlin Half Marathon (1:21:30), first overall at the 2017 Lovell Canyon Half Marathon, and fourth overall at the 2018 Red Rock Ten Mile Challenge in 57:55. 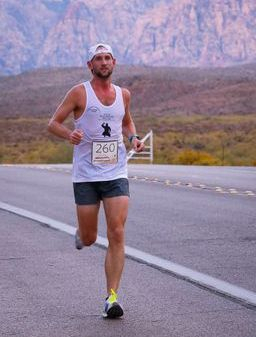 Jon would successfully defend his title at the 2019 Red Rock Canyon Half Marathon, winning the race by more than 8 minutes with a time of 1:21:33. Now, a brand new father and husband, Jon tries to juggle running with work and family life. He is very excited to be a part of the Ninja Endurance Racing team as of February 2019 and can’t wait to see what the future holds. Johnny began running in 2007, without any running knowledge or know how, just the idea of putting one foot in front of the other. His pace when he first started was around a 13 minute mile. At the time he didn't think comprehended how running would shape his life. Johnny participated in his first race thanks to his job, which had a relay race. Johnny would go on to run 5 miles. Shortly thereafter Johnny would start running 5K's and 10k's and culminated with his first half marathon at the end of that year. With this, Johnny discovered he enjoyed running and ability to push himself further than he thought was possible. As time went on he kept doing several 5K's, 10K's and halves for the next couple years until 2009 when he decided to attempt a marathon. Johnny would go on to run the Las Vegas Marathon finishing barely under 4 hours. "I can honestly say that finishing that marathon was one of the greatest moments of my life that I'll never forget; the moment is indescribable. Never in my wildest dreams could I have imagined finishing a marathon...it just seemed like the impossible." Johnny would say. At that moment Johnny embarked on a very challenging goal of completing 50 marathon in 50 states before the age of 50. It would a great way to see new places and incorporate his love for running. For the next 3 years Johnny would compete in several 5K's, 10K's, Half's, and Fulls...yet falling short of his marathon time. That would change in early 2012 shortly after joining the NER roster. Through the team's fundamentals, Johnny learned how to train smarter and in new ways that were unfamiliar with which brought his training to a whole new level. Since joining NER Johnny has PR'd in all four distances (5K - 20:12, 10K - 43:53, Half - 1:41:13, Full - 3:27:57). He has also done 23 out of the 50 marathons on his list and continues to work hard to increase his speed in hopes one day qualify for Boston. Johnny has also incorporated weight workouts as well as training for Spartan Races since it all has helped in making him a better runner. Chris Clark began his athletic career in 2007, after finding inspiration from the Olympics. He would begin speed skating, partaking in all levels except for ice. In 2007 he qualified for in-line Speed Skating Banked Track Championships on the Colorado Springs Olympic Training Center facility. Chris would also compete in 5 in-line speed skating half marathons. It was not till February 2011 that Chris decided to run his first race. As the races grew so did the interest which witnessed his training take on a more serious role. Over the course of the 2011 season Chris competed in 17 races, winning 4 of them. 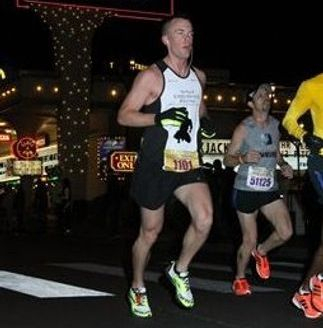 In December he completed his first marathon in 3:53 minutes at the Las Vegas Rock and Roll Half. A month later, Chris would compete in his first half marathon and would post a 1:32:55. At the Summerlin Half Marathon in April, Chris would drop his half marathon time to an impressive 1:23:59 placing 2nd overall. The following month at the Run for the House, Chris would set a new PR, this time in the 5K posting 17:06 en route to a 5th place finish. At the City Impact Ventura Half Marathon Chris would set a new personal record en route to a 5th place 1:23:45. Chris' current 10K PR stands at 37:16 ran in 2014. Alan Carreño began running in summer of 2003 joining the Durango High School Cross Country team. He fell in love with running but before the season started he dealth with season ending emergency appendectomy. After returning, Alan went on to compete the next 4 years of track and 3 years of cross country. Each season witnessed steady improvement as Alan become a strong runner as the years progressed running career bests in the Southern Regional Track Championships running 10:28 and 4:51 in the 3200m and 1600m respectively. After high school, he took a hiatus from the sport for 5 years to focus on getting his degree in electrical engineering. Upon graduating he resumed running and after 6 months he would rejoin the racing circuit. He joined the roster of Ninja Endurance Racing in 2013 and ran his first half marathon, the Long Beach International City Bank Half Marathon. Alan would debut with a time of 1:18:10, earning 16th overall. Falling in love with the distance, Alan decided to run a half marathon in all 50 states and a select few international races. In 2014 Alan incorporated cycling into his training regimen as a form of cross training to avoid injury. It would be a year, Alan would spend more time riding than cycling due to injuries picked up while racing. In fall of 2015, Achilles tendinitis forced him to stop running for 2 months, and with frigid temperatures, cycling took a backseat to indoor rock climbing. With this new regiment of running, climbing and cycling to recover and add additional cardio Alan's race times started to improve once again. He set personal bests of 16:34 in the 13th annual Runnin’ for the House 5K in 2017 and 1:13:12 in the Kentucky Derby Festival Half Marathon in 2018, and 34:01 in the inaugural Vegas Golden Night 10k in 2019. 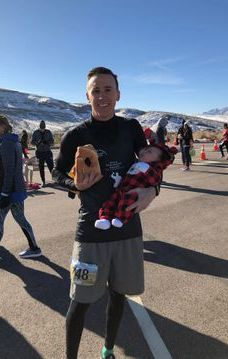 Outside of running he enjoys nature and landscape photography, going hiking and camping, and traveling to complete his 50 state half marathon challenge. Alan enjoys climbing and cycling and has also competed in local climbing competitions and cycling races for charity. Alan would complete a Century ride of 113 miles and is planning to compete in his first multi-sport event, the Rage Duatholon (5K run, 48.4 mile ride, 20K run). Alan is also looking to his first competitive bike race, the Ironhorse Classic road race in the mountains of Colorado in the Spring of 2019. Celeste Sportsman began running in May 2011 at age 39. Her desire to seek out new fitness goals, coupled with boredom at the gym lead to the birth of her running career. A month after taking up running, she would compete in her first 5K winning her age group with a time of 31:13. By August, she'd finished her third 5K posting a 27:24 at the 9th Annual Fire and Police Run. In November at the Six Tunnels Turkey Trot 5K she would set a season best mark of 26:04. The new found confidence led to her half marathon debut at the Rock n Roll Vegas Half in December 2011, finishing at 2:06:47. The new year brought the goal to post a sub 25 5K as well as a sub 2 half. She would run her first 10K in January crossing the line in 57:44. Shortly after that Celeste would run her current PR of 24:42 at the Fat Boy Run, just two short months into the season. In Hawaii, at the Divas Wahine Half Marathon held in April she would complete her second half and set a PR of 1:59:01. Seven months later, Celeste would collect her third PR of the season at the 32nd Annual Turkey Trot winning the female 40-44 age group in 53:15. 2013 saw more progress for Celeste, commencing with the 10K. Celeste would post 52:51 at the Las Vegas Track Club 10K Championship. In May at the OC Marathon, Celeste would debut in the event posting a 4:19:11. She has stood on the podium twice in the Las Vegas Xterra 5K at second place in 2013 and 2014. 2017 would open with a bang for Celeste at the Hot Chocolate 15k posting a PR with a 1:23:30. Upon entering masters status she would set new goals that included embarking on qualifying for the Boston Marathon as well as competing in an ultra marathon. 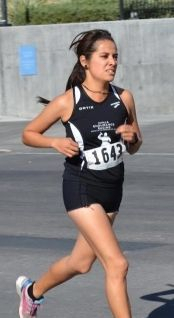 Crystelle's running career began freshman year at Vo-Tech High School, currently known as SECTA, in 2004. Initially Crystelle came out with the intention to join the track team, not knowing exactly what cross country was at the time. Once she finally figured out what she got herself into she fell in love. Crystelle would have instant success making varsity all four years of high school for cross country. She would have distinct honor of qualifying for state three consecutive years as an individual. In 2008, Crystelle would join the track program at Spring Valley High School. She would specialize in running the 800, 1600, and 3200. Her best success would come in the 3200, qualifying to state with a PR of 12:10. She would also qualify as a member in the 4X800, going on to win the event in a time of 9:47. Following her success in high school, Crystelle began her road racing career with extreme success. She would capture the win at the Ronald McDonald Run for the House 5K in a PR of 20:00. Two months later in August, she would place as the 2nd overall female at the Legends for Cross Country race with a time of 25:28 on a 3.75 mile course. After a few more successful road races, Crystelle would withdraw from the sport till August of 2012. Since then, she's been slowly but surely adding mileage to her workouts. In April of 2013, Crystelle would make her debut as a Ninja at the Windy 25 Run covering the 3.4 mile course in 24:09. The following month at the Ronald McDonald 5k, Crystelle would post a season best with a time of 21:46. Crystelle would take a three year hiatus and not compete for Ninja Endurance Racing in 2014 following a career change. Upon her return, Crystelle would capture the women's 25-29 age group at the 13th Annual Ronald McDonald 5k. At the Danny Gans Memorial Run in October 2018 Crystelle would take 2nd overall and posting her best time in 10 years running 20:59. A month later Crystelle would drop her time once more at the Turkey Day Boise 5k posting 20:49. Sierra DeGroff's running roots can be traced back to her days on the middle school track team. Her love for the sport began in the sprint events, before transitioning to middle distance upon entering high school. It was during that time that Sierra also began to run cross country at Blissfield High School in Michigan. Sierra is currently looking to run a sub 1:30 half marathon as well as running a 3 hour marathon. Her current PRs stand at 3:09 for the marathon ran at CIM in December of 2018, and 1:30 for the half ran at Rock 'n' Vegas in November 2018. Sierra also achieved a PR in the 10 mile distance running 1:04 at the Rd Rock Challenge in October of 2018. She is a 100k finisher along with qualifying for both the Never Summer and Western States trail runs. Her goals on trails are to PR at the 50 mile trail distance, complete the Tushars 100k and complete her first 100 Mile race in sub 24 hours at the Javalina 100 Mile race. An unlikely enthusiast of the sport, Kim began running at the age of 33 as a way to deal with the untimely passing of her father. As the miles added up, she found running is truly the best therapy. Kim completed her first half marathon in 2011 and her first full marathon in 2013. In 2014, she completed her first World Major Marathon, Chicago, as well as her first ultra marathon. In 2016, Kim qualified for the Boston Marathon with a PR of 3:33:33. Additional PRs include 5K: 21:18, 10K: 48:10, and half marathon: 1:39:17. Kim is looking to complete all six World Major Marathons and to date, has completed three: Boston, Chicago, and Berlin. Running also shaped Kim’s professional life; in 2018, she became Executive Director of the local council of Girls on the Run. A nationwide empowerment program, Girls on the Run inspires all girls to be joyful, healthy and confident through the power of running and physical activity. Kim is honored to bring the gift of running to the next generation here in Clark County. In November 2014, Mariane competed in her very first Rock 'n' Roll Marathon Series race. It was after this that Mariane was hooked. In 2016 Mariane decided to take her running more seriously beginning to train and compete locally and across the country. Mariane would go on to drop her 5K time from 25 minutes to 21:59 at the Legends of Cross Country 5k in August of that year. In 2017, Mariane began to mix road racing with obstacle course racing placing in several Spartan and Tough Mudder competitions. Her success led to her competing at the Spartan World Championship held at North Lake Tahoe in September 2017. 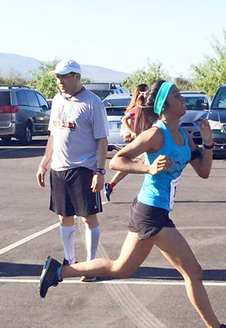 That December at the inaugural Vegas Strong 5k, Mariane would place 3rd overall in 22:47. In October 2018 Mariane would be the First Place Female Winner of the Spartan Terrain Race in held in Las Vegas. Melissa's running career began to blossom in hopes of improving her physical well-being as well as contributing to a good cause. Melissa would run her first 5k to help raise money for the Iowa City School District in 2008. With the encouragement from a friend, she ran her first marathon in St. George, Utah in October 2010 finishing in 4:26:19. Awed by the beauty of that course and the camaraderie of the participating runners, she decided to run another marathon in her hometown Milwaukee, Wisconsin in October 2011. The spectators ringing cow bells and a large cheese tent at the finish line helped her to achieve a finishing time of 3:28:44, that qualified her for the 2013 Boston Marathon as she bested her previous time more than hour. The Boston Marathon has further inspired Melissa to continue running. Since 2010 Melissa has gained an interest in trail, marathon, half-marathon, 10k and 5k running. Beginning in August of 2012, Melissa began a string of races where she won her age group nine out of ten times. At the end of the 2012 season, Melissa dropped her 10K PR to 42:10 en route to a 5th place overall finish. 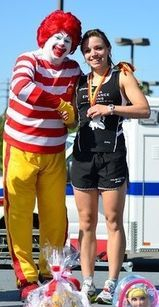 At the 2013 Ronald McDonald 5K, Melissa would set a PR of 19:33, while winning the event. Following an impressive win at the Windy 25 Run, Melissa would drop her marathon time to 3:13:53 making her the top runner from the state of Nevada to cross the line, at the iconic Boston Marathon. 8 months after having her first child, Melissa would run the San Diego Half Marathon in 1:29:24. Johnny Hilario's running career began during his sophomore year at Del Sol High School as a member of the track and field sprint team. It wouldn't be till that fall that Johnny would transition from sprints to distance joining the Dragons cross country program. Through hard work, Johnny would transition from a member of the junior varsity team to become the team's 6th overall runner. Johnny would go on to place 63rd overall at the Sunrise Region meet posting a season best 19:58 at Veterans Memorial Park. As a senior Hilario would move up to become the teams fourth overall runner. Johnny would have successful races as the season neared its end beginning at the Falcon Cross Country Invitational with his 42nd place 15:29 finish for the 2.5 mile course. At the Southeast Division race Hilario would have one of this best races crossing the line in 18:43 (38th overall). His final season of track and field witness record setting performances. In March at the Las Vegas Track Classic Johnny would post a 4:39 placing 16th in the men's 1,500m and finish the 5,000 in 17:24 to set a new personal record. A month later at the Skyhawk Invitational, Johnny would set a PRs in the 1600m with his 4:51 20th place finish and the 3200m in 10:37 8th place. In June of 2012, Johnny would run his first half marathon in 1:25:49 finishing 8th overall. In August, Johnny would post a 37:32 10K debut time while finishing 3rd overall at the ET 10K. 2013 would witness Johnny kick off the season with a runner up performance in the 5K, running 16:53 at the Trot for Spirit race in February. In May at the Run for the House 5K, Johnny would place 3rd overall with a brand new PR of 16:26. Johnny had stated that he was "not afraid of new challenges and was always looking for new running experiences. Seeking to become a stronger and smarter runner and test my limits while having fun in races." In June of 2013, Johnny's endeavors on the NER allowed him to earn a scholarship to run for Coffeyville Community College, making him the first runner on the team to earn a scholarship through running. He would go on set school records and earn a second scholarship to attend Minot State in North Dakota. Midway through 2015 Johnny would be diagnosed with Germ Cell cancer and would pass away in January 2016. Gabe's running career has been filled with growth and development despite its short history. As part of the new year and seeking to make changes in his lifestyle, Gabe began running in January (2011). His desires were to get in better shape and lead a healthier and happier life. With no prior knowledge or experience, Gabe's journey into the running world began at the age of 33. It wasn't long before he caught the running bug and realized that it is never too late to start. With a steady healthy diet and a solid running plan, Gabe has been able to lose 50 pounds. Gabe ran his first official race at the Las Vegas 5K posting a 26:01. Gabe would go on to finish 2011 with a season best for the 10K (46:41 at the 31st Annual Turkey Trot) and a season best half marathon finishing in 1:57:11 at the Rock and Roll Las Vegas Half Marathon. Gabe's progress in 2011 featured a string of 4 straight races where he would set PRs in the 5K distance, proving he is one of the team's most promising runners. 2012 would feature more record setting for Gabe, at the Disneyland Half Marathon Gabe posted a 1:42:54. Following that performance, at the 13 Annual Season 4 a Cure, Gabe would capture the male 35-39 age group in 21:27. The 2013 season opened with Gabe setting a new PR posting 21:03 at the Chefs for Kids 5K. At the Mardi Gras 10K in February Gabe would PR with a 45:45 while placing 20th overall. In only his sixth half marathon, Gabe's new personal record would drop to 1:40:01 at the 2013 Salt Lake City Half Marathon. In May of 2013 at the OC Marathon, Gabe would run his first full finishing in 4:17:27. Gabe would expand his training to include cycling, swimming and weight training in order to become a more stronger and efficient runner. "If you have similar aspirations, If you want to better yourself physically and mentally and live a healthier happier life, come join as at ninja endurance racing. With hard work, dedication and motivation, you too can become a ninja." said Gabe. Thomas Johnson would begin his running career at Palo Verde High School in 2006. He would go on to become the school's top runner following his sophomore year. Thomas' career would be highlighted by leading the men's team to the Regional Championship in Cross Country. As a senior, Thomas would narrowly miss setting the school record in the 1600m, running a 4:27 at the NIAA State meet. Following his graduation, Thomas would win many accomplishments as a member of Ninja Endurance Racing. He would be nominated for Las Vegas Track Club Runner of the Year in 2013 (finishing in second place), and to be first member to win an out of state race, doing so at the Long Beach 5K in 2013. Thomas would also earn 4th Place during the Las Vegas Track Club's Championship Series in 2013. He would be the 3-time champion of the ET 10K race breaking tape from 2010-2013. Midway through 2015 Thomas would cease to compete locally in events and walk away from the sport in 2016. Eddie's running career began at Sierra Vista High School competing all four years in cross country and track for the Lions. Success came after two years as Eddie would be named the most improved runner that season. In his final year of cross country Eddie would not only post a 17:00 PR, but earn the MVP award. His success carried over into the spring as Eddie would run a 4:45 PR in the 1600 and 10:30 in the 3200. Eddie's talents would help him land a scholarship at Dickinson State University in North Dakota. In his first season as a Blue Hawk Eddie would set personal marks of 26:20 in the 8K during cross country and 15:00 in the 5000m for track. Eddie's versatility would extend to the middle distance events as well as Eddie would run a 2:03 in the 800, 4:25 (1600m) and 8:55 (3000m). He would join NER during the summer of 2013 and compete at local events during his offseason from college. Eddie would help NER place second at the Legends of Cross Country 5K in the team competition. In 2013, Eddie would be the Outdoor NSAA 5K Champion, setting the stage for his 2015 Conference Championship in the same event. As a junior, Eddie would earn All American Status in the marathon running 2:38. During his senior year Eddie would capture the 10,000m Conference Title and set a new Conference Meet Record in the process running 34:03. In 2016 Eddie would cease to compete and leave the sport. Ray Fong's running career originated in one of the most prestigious teams in the county. Ray would be a member of University of Michigan's running club for two years. In his final season, Ray would run a 1:19:24 at the NIRCA Nationals 1/2 marathon earning 24th overall. His time would make him the 8th Wolverine to cross the line. Ray would be inspired to run his first marathon, following the death of his friend Mike Pietroski. Ray competed in the Detroit-Free Press Marathon from 2009-2011 running 3:33, 4:12, and 3:12. In 2013, Ray would kick start the season in record setting fashion at the Las Vegas Fat Boy 5K placing 2nd overall in 16:38 Ray would PR by more than 35 seconds. In his final event as a member of NER he would run the Las Vegas Rock 'n' Roll Marathon in 2:56:50. Ray would cease to compete for Ninja Endurance Racing in 2015 joining Red Rock Running Company. Raymond Green would join NER midway through 2014 and make an immediate impact as one of the top runners on the team. During his tenure, Raymond would win one event and finish no worse than 5th in every event he partook in. Raymond's running roots traced back to his days running cross country and track for Georgia Southern University, graduating in 2001. Raymond Green would move back to Georgia midway through 2016. Arc began running in December of 2010 as part of a corporate obligation for the Rock 'n' Roll San Diego Half Marathon in June 2011. Arc commenced without a training plan, athletic background, as well as weight problems. After early struggles, he would and an overhaul of his lifestyle Arc's running ability improved. He gradually went from one mile to three, five, then eleven miles, and dropped 45lbs of weight. Arc would debut at the event in 2:20:04. Following the race, Arc would sign up right up for the Las Vegas Half Marathon in December, and go on to finish with a time of 2:25:20. For 2012, Arc, took a break from running, and started going to the gym to strengthen his body to run more efficiently, and injury free. Upon joining Ninja Endurance Racing in 2013, Arc, has become a stronger, smarter, and efficient runner. Arc would also lower his 10K time to 47:08. In October 2013 at the Long Beach Half Marathon Arc would run a 1:36:41. His current 5K PR stands at 19:06. In 2015 Arc would cease to compete with Ninja Endurance Racing following a career change. David began running in the 7th grade at Marco Forster Junior High in California. David would go on to post a 5:41 mile in 7th grade and 5:18 in the 8th grade. After a successful middle school career, David would attend Dana Hills High School. David would become a four year Varsity letterman in cross country and track. During his freshman year the team finished 12th in CIF, climbing as high as 5th overall by his junior season. David's track career would be filled with tremendous success Posting times of 2:07 for 800, 4:39 for 1600, and 9:48 for 3200 in track. After giving up the sport for 23 years, David decided to start up again in 2008. 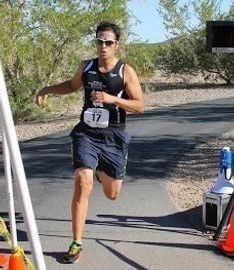 David joined Ninja Endurance Racing in 2012 following years of membership to the Las Vegas Track Club, looking to take his running to the next level. During his time with NER, David posted times of 20:31 for the 5k, 43:27 for the 10k and 1:36:54 in the half marathon. Max Skidanov would join NER during the early part of 2013. In his brief time with NER Max would earn several age group wins and set a 5K PR of 20:36, 43:36 for the 10k, and debut in the marathon posting 3:57:13 at the Long Beach Marathon in 2013. Max would begin to focus on triathlons in 2016 and cease to compete for Ninja Endurance Racing. Johnny Razo would join NER in 2013 and deliver strong performances earning age group wins and several awards in two years. His PRs earned were 21:50 in the 5k and 44:03 in the 10k, as well as 1:35:19 in the half marathon. Johnny would cease to compete for Ninja Endurance after earning his certification as an EMT in 2015. Michael began his running career in high school (1600m, 800m and 4x400). During his high school career, Michael would become the city champion for 2 years in the 800m and 4x400. At the state level Micheal's relay team would place 6th. After high school, the United States Army was his calling, during this time he picked up a smoking habit which would become a major part of his life. Along with serving in the armed forced, Michael would run with the Hash House Harriers, a club that is notorious for not only consuming drinks but putting miles on the road as well. Their reunions would typically be weekly to run a couple of miles then sing foul mouthed songs while enjoying a cocktail of your choice. Everything changed in December of 2008, it was during this time that Michael would observe the Las Vegas Marathon's take over of the strip. This sight would rekindle the running flame and the decision to compete in next year's half marathon was made. Shortly after, Michael quit smoking, (March of 2009) and began training once more. Micheal's lone race that ENTIRE year would be the half where he would finish in a stellar 1:48:44. Since his return to the racing circuit, Michael has ran four halves and one full (3:12:30). In 2011 he joined the Las Vegas Track Club in order to compete in the Championship Series with their monthly races. Michael would compete in 12 events in 2011 finishing no worse than top 20 in local events (the exceptions being The Legends of Cross Country 5K and Las Vegas Rock n Roll Half. Micheal's performance in Vegas (1:33:57) would be spectacular and him earn him 4th place overall in the Las Vegas Track Club's Championship Series. 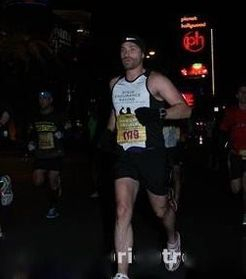 The 2012 Racing season began with more success as Michael would set a new personal record at the Rock and Roll Arizona Half Marathon in 1:28:36. 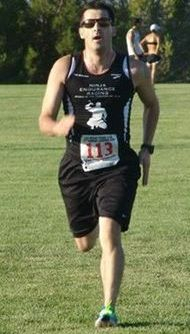 In May at the Run for the House, Michael would collect another age group victory en route to setting a new PR of 18:39. At the 32nd Annual Turkey Trot in November, Michael would notch his third PR of the season, this time in the 10K with a 40:50. Michael would cease to compete for Ninja Endurance Racing following a career change in 2014. Matt Shelton began his running career in 2007 as a freshman at Durango High School. He did not know of cross country or track, but his father pushed him to join the sports knowing that he could become great in it. Through hard work, and a driving motivation to “run with the big boys” Matt excelled as a high school runner qualifying for the Nevada State Championships sophomore and junior year. In cross country Matt earned a PR in the 5000m at 17:16, barely missing his current goal of achieving a sub 17 minute 5K. Matt has also excelled in track as well. Achieving PR’s in the 800m at 2:04, 1600m at 4:33.7, and the 3200m at 10:27.3. 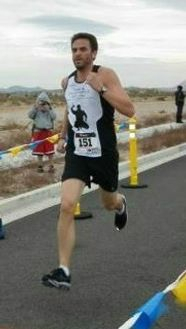 Matt also ran the Las Vegas Half Marathon in 2010 achieving a 2nd place age group finish and a 1:23:58. 2012 has brought Matt to the triathlon scene, competing in four events during the calendar year. Matt would cease to compete for Ninja Endurance Racing following a career change in 2014. Michael Green began his athletic career at the age of 13 as a swimmer. Michael would become the captain of the Bishop Gormon swim team before graduating in 2002. After high school, Michael went on to participate in NCAA D1 swimming at Cal Poly for another four years. His running career began as part of his college training, which lead to his first races following his college graduation. Micheal would run his first half marathon in Huntington Beach in 2009 posting a 1:31:25 respectably. He followed that performance by competing in 4 marathons in 2010, finishing the year with a Boston qualifying time at the California International Marathon in 3:09:20. In 2011 Michael would have his most fulfilling season setting three PRs in the 5K (18:38 at the Esri 5K in July held in San Diego California) and 10K at the 31st Annual Turkey Trot in 40:23. Two weeks later, Michael would turn another record setting performance at the Rock n Roll Las Vegas Half Marathon coming through in 1:26:30. 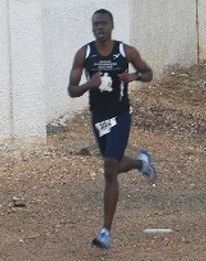 The record performances helped Michael earn 9th place in the 2011 Las Vegas Track Club Championship Series. The success would help him qualify for Houston where he would run a 3:03:50. In 2014 Michael Green would cease to compete following the birth of his second child and career relocation. Scottish born and bred, Lisa moved over to Las Vegas in May 2012 to work as a Physical Therapist. Lisa started running/jogging in 2007 to improve fitness and attempt a marathon. During this training, a friend invited her to take part in a Triathlon which transformed her view on running and the sport. After a disappointing Marathon in 2007, Lisa decided to take on the New York Marathon to celebrate her 21st birthday. Lisa completed the marathon in 2008 in 4:00:05...Disappointed to not make the 4hour mark, she left Marathon and running to focus on Triathlon and multi-sport. In the coming years, Lisa qualified for the GB age group team, working her way up the rankings, and traveling all over the world to World and European Championship events. Most notably of these were silver medal in Athlone, Ireland at the European Olympic distance champs in 2010, followed up with 5th place in 2011 at the European champs in Pontevedra, Spain and at the World champs in Beijing, China. Leaving the Tri season on a high, Lisa continued to work on her run time which in early 2011 was around 47mins for 10k, and by this point she had taken it down to around 43/44mins. Focusing on the 10k, Lisa managed to achieve 41:30 at 2 separate 10k events on hilly/windy courses. Not content with that, she broke the 40min barrier whilst competing in the National Duathlon champs, and followed that up the next weekend with 39:09 on a hilly 10k course, winning the Garioch 10k. Just before leaving Scotland, Lisa bid farewell to her home country with a 10k at Balmoral castle in Royal Deeside - a course notoriously challenging - but looking to enjoy the course and savor the last of the Scottish racing ambiance, she placed 3rd with a time of 40:45, seconds behind 1st and 2nd. 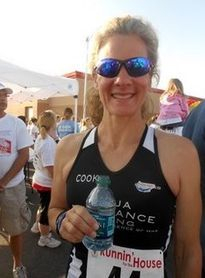 Lisa would cease to compete for Ninja Endurance Racing in 2014 focusing on triathlons. Theresa's running career originated at Palo Verde High School during her senior year. She would transition to the sport after being an equestrian for five years. During her lone cross country season Theresa would help Palo Verde capture their first state title in cross country. She would set her 5K season best at the Huntington Beach Invitational in Central Park posting a 21:01. She would finish the season as the team's fifth runner, and earn a varisty letter. In the spring of 2011 Theresa would be a member of the Palo Verde swim team. Following her graduation in September 2011 Theresa would win the Lifetime Athletic Indoor Triathlon for the open under 40 male & female divisions. 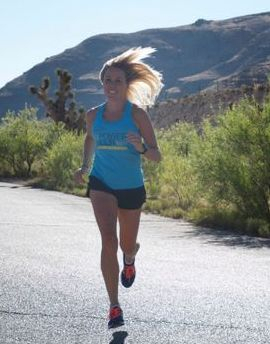 Her winning ways would continue capturing the Valley of Fire 5K in November. She would debut in March winning three consecutive age group victories, highlighted by her 20:57 mark at the Run Away with Cirque du Soleil 5K. Over the next two months Theresa's performances would deliver more Age Group victories, the highlight being at Race for the Cure placing 38th overall. Her 20:44 would place Theresa as the 3rd overall female in the event. At the Run for the House 5K, Theresa would once more PR this time in 20:22 finishing as the 4th overall female. Debuting in the 10K at the 32nd Annual Turkey Trot, Theresa would place as the 4th overall female in 44:11 en route to winning the female 15-19 age group by 3 minutes. At the Las Vegas Rock n' Roll Half Marathon in December Theresa would debut in 1:42:11 while placing 9th in the female 18-24 age group. Her inclusion on the NER roster made her one of the most decorated runners on the team. Theresa would cease to compete for Ninja Endurance Racing in 2014 after studying abroad in Costa Rica en route to obtaining her undergraduate degree from UNLV. Priscilla's running roots initiated at Valley High School in 2007. After two years at the junior varsity level, Priscilla would break through in 2009 helping Valley capture their first division title in years in cross country. At the Region Meet she would finish 49th overall setting a season best of 24:35. That spring she would post a PR of 6:16 in the 1600 and 13:43 in the 3200m. Priscilla would constantly finish in the top 5 that season and capture one victory. Her senior season would be hampered by injuries forcing a transition into the 4x800 relay team. Upon graduation, Priscilla would withdraw from competing till returning in 2012 to the pavement. Priscilla's NER debut was unofficially in February at the Sweatin' Sweethearts Relay. In March, after a two year hiatus from the racing circuit, she would post a 22:22 at the Run Away with Cirque du Soleil 5K. Her performance would capture the Female 20-24 Age Group. Over the next three races, Priscilla would continue to improve her PR in the 5K. Commencing in May at Race for the Cure, Priscilla would place 62nd overall and earn 2nd in the Female 20-24 Age Group with her 21:53. 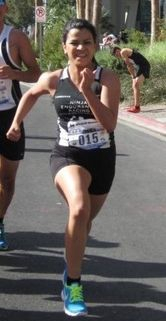 In October at the Long Beach International City Bank Half Marathon Priscilla would debut in the event posting a 1:47:24 en route to a 12th place finish in the female 20-24 age group. Priscilla would compete in her first 10K posting a 44:38 to win the female 20-24 age group at the 32nd Annual Turkey Trot in November. The 2013 season began with immense success as Priscilla finished in the top 5 in three consecutive races capped off by her personal best 20:12 2nd overall finish at the Race for the Cure in May. Priscilla would also go on to win the Las Vegas Track Club's Championship Series that year. Priscilla would cease to compete for Ninja Endurance Racing in 2014 joining Las Vegas Running Project. Amy Mathis Leonard's running originated via her charity work forming teams for Race for the Cure in 2005. In 2008, in an effort to get in better physical shape signed up for a 5k each month of the year. The following year Amy completed her first 8k propelling her to run 10Ks and half marathons. 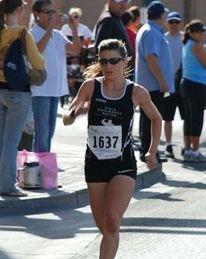 2010 witnessed her running career join the Las Vegas Track Club as well as captaining a team for Las Vegas Ragnar Relay. In December she completed the Las Vegas Half-Marathon in 2:19. The following season she expanded her running career to include Championship Series Events, and once more captaining another Ragnar team. that December Amy improved her time at the Vegas Half completing the course in 2:15:26. 2012 brought more improvement as well as PRs. At the Rockin Rabbit Trail Half Marathon in April Amy would post a 2:07:32. A week later, at the LVTC Low Key 5K Amy would run 26:00. After a string of 5Ks that saw her hover around a PR, Amy bested her previous half marathon time by 31 seconds at the Really Big Free Half Marathon held on November 3rd, coming through 2:07:31. Amy would follow that PR with another record, this one achieved in the 10K at the 32nd Annual Turkey Trot en route to a 53:46. 2012 featured Amy placing 7th overall in the Las Vegas Track Club Championship Series. The success would spill over to 2013. Amy would make her marathon debut at Surf City, covering the 26.2 mile course in 4:56:30. 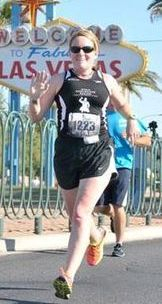 Two weeks after debuting the marathon, at the Las Vegas Fat Boy 5K, Amy would drop her 5K to an impressive 25:07. In April at the Habitrot for Humanity, Amy would run a 24:14. At the OC Marathon in May, Amy would PR in the marathon running 4:27:17. Amy would cease to compete for Ninja Endurance Racing in 2015 after taking a hiatus from the sport. Betty Cook was the most decorated runner on the team. Despite being a mother of two active boys she still managed to run 7 days a week. The grueling schedule paid dividends as Betty had many Overall Female wins, among them the Ocean Shores Big Weekend Half Marathon Trail Run in 2006 posting 1:53:39. In 2011, Betty would be crowned the Las Vegas Track Club Championship Series Female Winner. 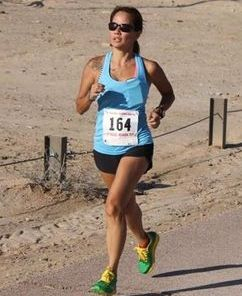 She would also be named the RRCA 2011 Masters Female Runner of the Year for the state of Nevada. Betty would finish as the top overall female at the Susan B. Komen Race for the Cure (20:53), and Ronald McDonald Runnin for the House run two weeks later (20:40), a race she has now won two years in a row. Her winning ways continued into the summer and fall months notching victories in the Forest Challenge 6 miler and the Four Seasons Season for a Cure Run (for the 2nd year in a row). At the Danny Gans 5k Betty would be the runner up and in November at the Turkey Trot she would place 3rd Overall. December would feature Betty qualifying for the New York City Marathon at the Las Vegas Marathon, placing 10th in her age group in a time of 3:32:34. The season would be capped off with her winning the Las Vegas Track Club Championship Series. 2010 was as equally as successful for Betty as she would be the runner up for the Championship Series, notching 7 age group victories that season. Her success over the past two seasons earned her a sponsorship from Spira on their Elite Masters Team. In her spare time, she loved video games and watching her boys tear it up ninja style on the baseball field. Betty would cease to compete for Ninja Endurance Racing in 2014 following a career change. Maria Landero's running career began during her freshman year at Valley High School in 2005. Joining track and field to stay in touch with friends and more importantly to maintain a healthy lifestyle, Maria quickly found success becoming early on, being a varsity cross country for three years, along with the four years of varsity track. The constant top performances would make Maria one of the top runners on the team. At the 2006 Fresh-Soph Championships in October, Maria placed 29th covering the 2.5 mile course in 18:27. Three weeks later, Maria would help Valley finish 7th at the Southern Nevada Regional Cross Country placing 45th in 24:28. In 2007, her junior season, at the Laughlin Invitational Maria would be the 10th local runner to cross the line(17th overall), doing so in 24:12. Maria would help Valley High School's program finish 3rd at the Southwest League Cross Country Division Meet in October earning 3rd overall in 23:05. Maria's senior season would be the breakout year highlighted by Valley capturing the 2008 Southwest League Cross Country Division Championship. Maria placed 6th overall in 21:31, dropping her time by more than 3 minutes. After graduating high school, it was very difficult for Maria to continue running consistently. Although, Maria had always been very active and enjoyed playing various sports, during college her priorities became working and finishing school. However, in February 2013, she realized that something was missing in her busy everyday life. Running. Not only does it help her stay fit, but it is the answer to release stress and help her stay organized throughout her busy day. 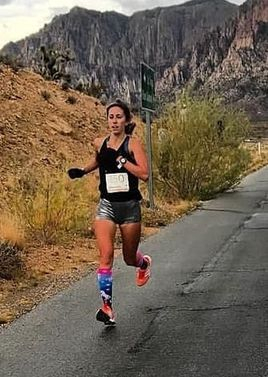 After many years away from the racing world, Maria raced at the Las Vegas Fat Boy 5K winning her age group in 24:55 helping her realize that Ninja Endurance Racing would help bring back the competitive spirit she had throughout high school. Three months later Maria would run a season best 22:45 at the Ronald McDonald 5K. Maria would cease to compete for Ninja Endurance Racing in 2014 upon entering graduate school at UNLV. Dagny Signorelli earned four letters in cross country and three letters in track at Cimarron-Memorial High School. During her tenure as a Spartan, Dagny's top times would 800 (2:28); 1600 (5:45); 3200 (12:45); 5000 (20:31) Dagny would also be named to the all-state academic team for cross country and soccer. She would move on post high school to compete for Montreat College in New Jersey before making the jump to the University of Nevada-Reno in the fall of 2012. Dagny would cease to compete for Ninja Endurance Racing after leaving the sport in late 2013.